In order to understand the hoax being “Played” out upon mankind one must read the book of Ezekiel in entirety. Gog is representative of Satan between the temple era’s. Gog is also representative of spiritual Satanism in the Book of the Revelation of Christ. The scheme has been planned for 2000 years at the least. It is orchestrated to obtain the Babylonian World Order. If the governments of the earth were opposed to it, How do you think they could expect ever to vision it? All “Actors” are in place to bring ITSREALLYHELL to world dominance. Satan has given them their power and authority. Do not fall for the fables of the jews, come out of that Great Harlot..The following is also my conclusion and very well written. The Evangelical Telly Tubby Tamudic Televangelist are setting you up. Beware ! There are no world powers opposed the the Jewish Babylonian World Order. Russia, China, Iran or any other. Fact is, Scripture which has given the final Prophesy that this Order will be Fact, Written and Orchestrated by the Living Lord God Almighty. All of the kings of the earth are in bed with Mystery Babylon the MOTHER Harlot of the Earth. Do not be deceived by them who are making Vladimer Putin into a man god savior of the earth, he is playing to the Piper as is all the rest, and by the Power of Satan whom they serve. Behold the Vipers who have set up this farce, GOG themselves who Hate Christ Jesus the Lord God Almighty the CREATOR……. Nine Russian and Chinese warships kicked off joint military exercises dubbed, ‘Sea Cooperation – 2015’ in the Mediterranean on Sunday, the Russian Defense ministry said. “The active phase of the exercises will be held in the Mediterranean between May 17 and 21, about 10 warships from the Russian Navy and the People’s Liberation Army Navy [of China] will be participating,” a statement from the Defense Ministry said. The goal of the Russia-China exercises “is to strengthen mutual understanding between the navies… regarding boosting stability, countering new challenges and threats at sea,” Vice-Admiral Aleksandr Fedotenkov, a deputy commander of the Russian Navy, who is leading the exercises from the Russian side, said. The Russian-Chinese exercise comes at a time when NATO and its allies are holding military drills all over Europe. Earlier, Russia announced its land forces will take part in a series of joint drills with troops in China, Belarus, India, and Mongolia later this year. The exercises will focus on peacekeeping and antiterrorist activities, the Kremlin said. With relations between Moscow and the West having deteriorated over the Ukraine crisis, Russia has increased cooperation with its Chinese neighbors, in both economic and military spheres. Quoting from the ‘follow up’ post linked above, the last line: “all the players are being lined up”. The operative word there is “players”. Players as in a scripted production. 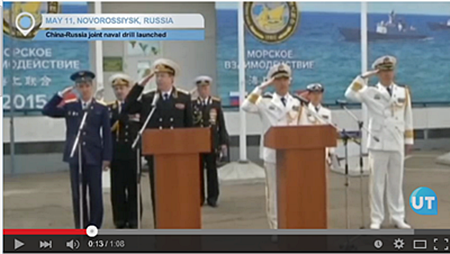 As made clear in this ‘Russia-China Joint Drill’ article, the players are clearly assuming their assigned positions. Thanks to the “Ukraine crisis” the “West” and Russia are moving apart, and Russia and China are moving closer together. Exactly what the script calls for. This is of course not the first story of the increasing alliance of late between Russia and China but it would seem to mark a definite escalation as far as outward activity goes. Russia and China are of course being made out to be the key ‘players’ making up the supposed ‘Gog-Magog’ alliance of biblical prophecy, as promulgated far and wide by too many Judaizing false teachers over too many years to name here. Understanding though that a correct scriptural interpretation of the Ezekiel 38-39 passage where Gog and Magog are found makes this heavily-hyped Russia-China interpretation an absolute impossibility* – leaves only one possibility: it has to be a production. Now certainly every production of any sort needs planning and preparation, and certainly the greater the goal of any particular production the greater planning and preparation would be needed to assure that all goes off without a hitch. How much planning and prep then should it be supposed would be required to pull off something as huge as a fake bible-prophecy Gog-Magog WWIII “prearranged” for final Zionist global-conquest to achieve their ages long quest to “rule the planet and mankind”. Answer: very likely exactly the type of immense military exercises that are here now being seen on the global stage. Russia and China coming together, familiarizing themselves with, and ironing out the details of the script, getting their stage cues down, everyone learning their lines, so-to-speak, so that when the time comes and the director yells “action” – it all goes ‘just the way they drew it up’. That would of course be the ‘Divine deliverance resulting in Israeli victory’ scenario as previously suggested [see ‘follow up’]. The question I pose to you is the whole earth think the UK is a broken empire . There is thoughts that prince William is a cloned fleshbag from the blood off the “shroud of turin” or spear of Longinus . Considering the rothschilds consider the UK home and are the bankers of the pope ? Since the temple of the Almighty is NOT made with man’s hands . According to the New Covenant the temple of Jesus Christ are our bodies . Consider some theorize that the prophet Jeremiah traveled to Ireland right after the judahites and benjamites were taken to Babylon . It is said that the UK monarchy’s throne has the stone of Jacob under it . It is said that prince William claims to be a decendent of Judah . There is no KING but Jesus Christ , so ALL earthly “kings” are a sham . But we will not know until he is “Revealed” and we see the two witnesses in Jerusalem, soiritual Sodom and Egypt. Realize that many will die. And don’t worry Obama not is alone who destroy earth now I complete puzzles no one can run away from this mess. This is From Reagan, And many more. punishment for the government. They should protect us not destroy. Is message from Lord to Who we agreed to protect us. I know what happen In past what is on now and what is further. Because this is Free well from every one this who don’t back from wrong road go on judgement. The Reign of the LORD’SAnointed. Your faithfulness reachesto the skies. I awoke, for the LORDsustains me. Not the end of the world, only the conclusion of the system of things. Because this is hypocritical and corruption etc. Every thing is possible when You are good men. And you all about money. Money destroy you and every freedoms and Planet where for yours money many animals we lost and many we see only in ZOO. Where is Forest. And now where is your money? For this money you destroy everything shame. You know what Holy Bible stay for ever.